Bridget Bate Tichenor was born in 1917 to a prominent British family. Aided by her parents’ connections, she moved to Paris at age 16 and began modeling for Coco Chanel and posing for photographer Man Ray. In 1943, hoping to alleviate financial burdens and remove Bridget from the threat of World War II, her mother arranged her marriage to Hugh Chisholm, a wealthy American. The couple lived in New York, where Bridget continued her glamorous lifestyle, posing for fashion photographers and working as the Fashion Editor of Vogue magazine. She also studied art in earnest, enrolling in The Art Students League and studying under Reginald Marsh. She befriended painter Paul Cadmus and photographer George Platt Lynes. 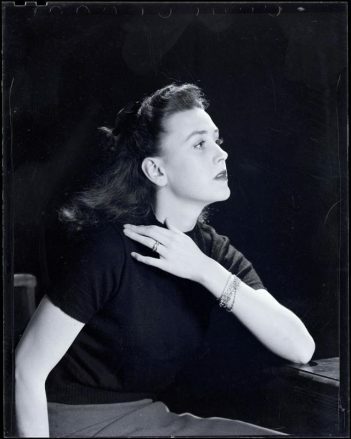 In 1944, she began an affair with Platt Lynes’ assistant Jonathan Tichenor, whom she married after divorcing Chisholm. In 1947, Tichenor was introduced to Mexican culture through her cousin Edward James, the eccentric British collector and patron of Surrealist art. Tichenor visited his home in Mexico several times, and became enchanted with the country. In 1953, she divorced Jonathan Tichenor, left behind her fashionable life in New York, and moved permanently to Mexico to focus on her art. Tichenor drew inspiration from the landscape of Mexico, religion, mythology, alchemy, and used her Italian Renaissance technique to create her Surrealist paintings, which are filled with fantastic creatures and magical scenes. She befriended other Mexican artists, including Leonora Carrington, Alice Rahon, and Pedro Friedeberg. She spent the rest of her life creating artwork, until her death in 1990. In recent years, there has been growing curatorial interest in Tichenor’s paintings. Her artwork was featured in Women: Twentieth Century Artists in Mexico, held at the Museo de Arte Contemporáneo de Mexico in 2008. 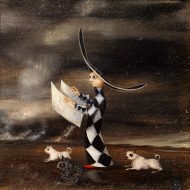 She was also included in the 2012 exhibition In Wonderland: The Surrealist Adventures of Women in the United States and Mexico, organized by LACMA and the Museo de Arte Moderno. The Museo de la Ciudad de Mexico mounted a comprehensive retrospective of Tichenor’s work in 2012, Bridget Bate Tichenor: Retrospective at Museo de la Ciudad de Mexico, featuring over 100 paintings by the artist.